Ciuchinoi is not just a wine, but it is also our small contribution to protect the biodiversity of the Amazon Rainforest. The profit of the sales of Ciuchinoi are destined to the Otonga Association created in Ecuador by Father Giuseppe Onore, entomologist, Professor at the Pontificia Universidad Catolica of Ecuador, with headquarters in Quito. Otonga is compromised on buying parts of the forest on the western slopes of the Andes chain to preserve the exceptional characteristics of its biodiversity. Up to this day approximately 1.500 hectares were purchased. In 2003 it was started the construction of the “Educational Center” to host visitors, students and researchers from all over the world, and scholarship funds are conceded to promote research besides many other activities to maintain the association. To learn more, click here. In 2001 Luca travelled with a colleague to the Amazon Rainforest where they stayed for three weeks and had many new experiences, met many different people and kept a link that he keeps until today. It is a beautiful and important project that we support not just with funds, but also promoting it. Ciuchinoi is made just with Grignolino grapes and it is a very simple and pleasant wine made in fiberglass tanks and sold around one year after its harvest. 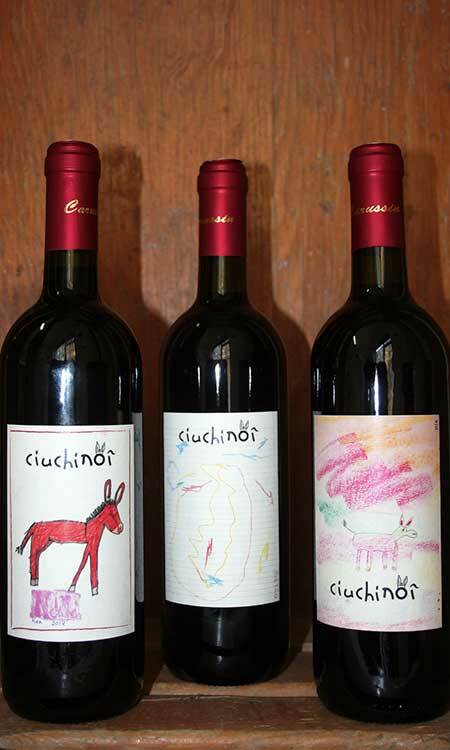 Ciuchinoi has three different labels, each one represents a donkey drawn by a kid. The kids that visit the farm and join us in the activities of the Teaching Farm leaves us so many beautiful drawings that we chose three on which there were just the donkey, without people or other animals. The drawings were made by Vita, a Norwegian girl of 7 years old, Pietro, an Italian boy of 3 years old and Nina, an American girl of 9 years old. They have played with the donkeys and made these drawings. When they made these drawings I couldn’t choose one, so I’ve picked all three! !